Just spotted these new, low calorie ice cream bars at Sprouts, and they are sooooooo good, I couldn’t wait to share! 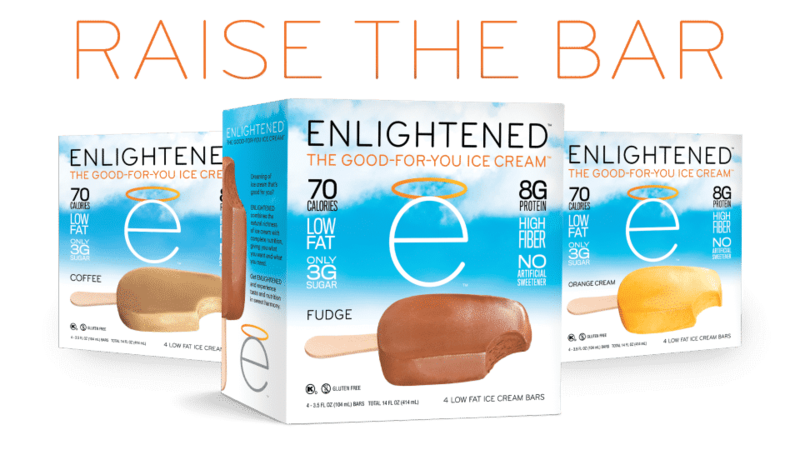 Enlightened, The Good For You Ice Cream has launched a line of ice cream bars that are just 70 calories each and only 3g of sugar, with NO artificial sweeteners, and are only 2 Points per bar. They also don’t have any synthetic dyes or flavors, which is great. But most importantly, they taste fantastic, and make a great sweet tooth satisfy-er for when I need ice cream, but don’t have many Weight Watchers Points left to spend. Sure, there are lots of other frozen treats out there in stores that are low in Points, but I love Enlightened because they have really kept their product natural. And they are loaded with fiber and protein, so they really help keep you satisfied. Coming in 3 fantastic flavors: Coffee, Fudge, and Orange Cream, Weight Watchers can now delight in an all natural ice cream treat that won’t use up many of those sacred Points. These bars are creamy, flavorful and perfect for a sweet snack. I highly recommend giving them a try. Find out HERE where to buy them!